Listen up Hollywood. Over the past few years, we have had to endure some of the most ill advised, money grabbing, logic defying, tiresome, pointless and downright shoddy remakes ever committed to film. Isn’t it about time you gave us something back? 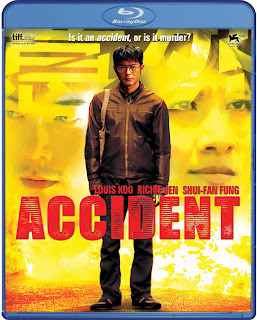 From Soi Cheang - director of Shamo and Dog Bite Dog - this is the new suspense thriller Accident. Louis Koo (Overheard) takes on lead duties as a paranoid hitman who designs his hits to look like freak accidents. The film co-stars Michelle Yip, Lam Suet and Stanley Fung, with Johnnie To acting as producer. Hitman Fai (Louis Koo) engineers the perfect murders, carefully choreographing his killings in a similar style to the death designs from the Final Destination series. One failed mission however, leaves a member dead and the team in disarray. Was it an accident, or has someone beat them at their own game? Smelling foul play, and suffering from an increased sense of paranoia, Fai suspects that he's been set up by insurance executive Chan (Richie Jen). Slowly losing his cool and his mind, Fai becomes obsessed with cornering Chan and doing whatever it takes to regain control. With Accident, Soi Cheang has crafted a tidy yet flawed little thriller that might actually benefit from the Hollywood treatment. Just so long as they do it right of course, don’t want you thinking I’ve forgotten my medication again. The Departed worked out ok, even if it did drag its heels towards the end. So back to you Hollywood, how about remaking something that could actually benefit from your interference for a change? It’s a big ask I know, unless of course you have Sadako Vs Kayako to make first. Accident won’t suit everybody; it’s a sombre affair, measured and moody. Even at just under ninety minutes, Soi Cheang allows himself plenty of time to set the right tone. It’s a courtly approach then, intricate and contemplative. The downside being of course that some will find the leisurely pace distracting, possibly even boring. Not so much in the first half, Soi Cheang sets his dominoes up in methodical fashion. Watching the accidents play out is satisfyingly addictive, or should that be addictively satisfying? Either way, Accident comes complete with some memorable set pieces, set-ups enhanced by the director’s laboured approach. As with the Final Destination series, guessing how events will play out is half the fun. Not that Accident shares anything else in common with those particular movies; don’t want you getting the wrong idea here. 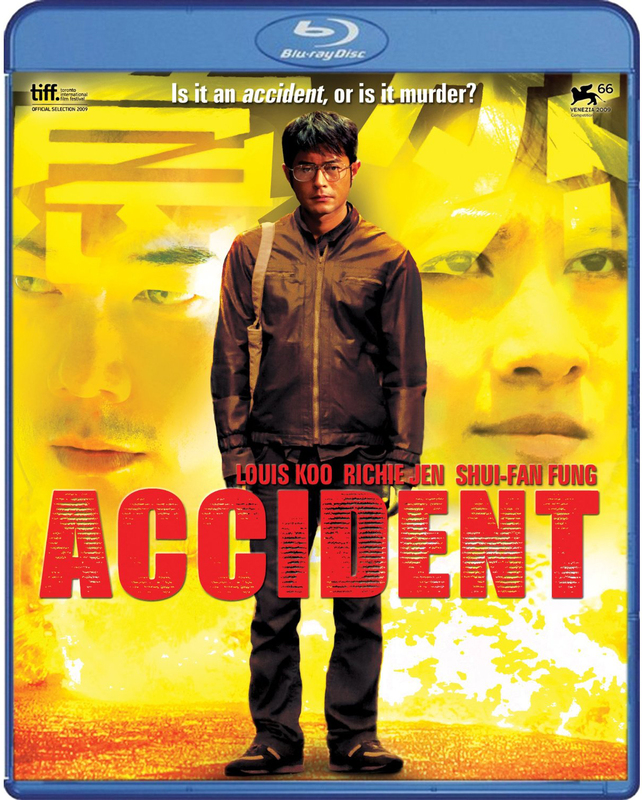 Accident is a psychological thriller, where actions speak louder than words. Though come to think of it, if Death ever considers taken on new employees, he could do far worse than Fai. 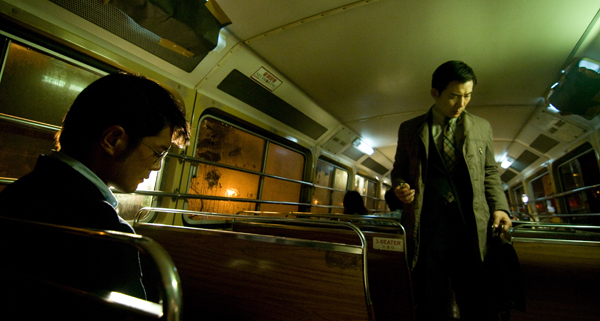 Louis Koo is the one to watch, handling the complexities of a visual performance well. With dialogue sparse for much of the films running time, he copes well with the deep-rooted anxiety and imperfections of a conflicted central character. The rest of the cast perform admirably, but make no mistake about it, this is Koo’s movie. It’s a shame that Soi Cheang feels the need to take the rest of the film in a different direction; Accident leaves behind its elaborate trimmings and heads into deeper, darker, gloomier waters. Paranoia sets in and Fai spends the rest of the movie eating away at himself. Convinced that the world, or Richie Jen’s Chan to be precise, is trying to bring him down, Fai spends the final act listening to wire taps and following his would be nemesis around. All well and good I suppose, but it doesn’t always make for gripping viewing, more cat and nap then cat and mouse. The biggest fault of the movie lies in the writing itself, for a person so meticulous in his approach work; Fai finds it all too easy to suspect the people around him. He is far too quick to condemn his trusted colleagues, and a subplot involving one of the main characters developing amnesia comes on like a bolt from the blue. Accident could actually benefit from a little more time spent in the oven. We don’t really get to know very much about any of the characters, a little more depth would’ve added weight to the films dramatic conclusion. The ending is downbeat; hardly surprising considering the mood of the piece, and it’s certainly in keeping with the rest of the picture, but it doesn’t grab hold of you in the way that it should. Probably because I didn’t care for the characters as much as I would’ve liked, Fai may be a killer at the end of the day, but he’s not a machine. His humanity is occasionally lost in the rush to wrap things up quickly. A well-constructed Hollywood remake seems unlikely but Accident brings with it an original concept and room for improvement. Like I said, a Hollywood remake seems unlikely. The central performance is noteworthy; as is the assured direction and pitch perfect score. There are moments of genius at work here, weighed down by lazy writing and unconvincing plot developments. The second half feels rushed, even if it still takes an age to reach its destination. It’s a shame because Accident could’ve been one of the best movies of the year, in its current form; it’s a worthwhile departure from the norm that should be applauded, just not too loudly. The build up is more satisfying than the pay off, but Accident proves itself to be an admirable effort none the less. Just don’t expect to smile too often; Soi Cheang follows Shamo and Dog Bite Dog with yet another moody affair. I wonder what he’s like at Christmastime.